Are you ready to ditch your bulky travel system that you spent a fortune on? LOL. Don’t feel bad. Most parents are trying to downsize after the first year. Traveling and running errands will be a breeze if you can throw your stroller over a shoulder or toss it into a trunk of the car. If you are still hunted by the nightmares of choosing a stroller and dreading the moment of starting the whole research process all over again, you came to the right place. 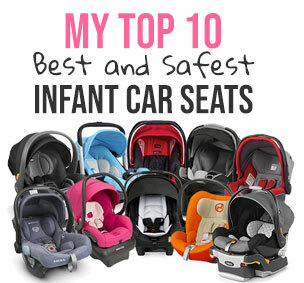 I have a great list for you of top 10 lightweight strollers that are the BEST on the market right now. Unlike some other sites that have never seen or tested anything, I’ve tested all of them myself and also read all of the reviews from other parents. My list below has a good mix of umbrella and compact lightweight models under 15 lbs that are great for on-the-go lifestyle. I will be updating this list on a regular basis as soon as I see better models. And here is my ‘Top 20 Best Strollers For 2018‘ list which has models from all the categories. BTW, I’ve noticed that non-umbrella models are becoming more and more popular among the parents. If you ask me, I do like non-umbrella models more too because they usually have more manageable squire fold, larger basket and single handle bar that is definitely better for one-hand navigation. Also, many of them now can be turned into a travel system unlike umbrella models. The BabyZen was the first company that came up with a super compact stroller that was allowed as a carry-on. The Yoyo+ 2018 is one of the most popular models among traveling parents because it’s light (only 13 lbs), super compact, and can transform into a travel system. The roomy seat has a deep recline and nice size side barriers. The seat can be used from 6 months and up to 40 lbs or if you want to use it from birth you can get an infant pack. All the fabrics are machine washable. The canopy is a nice size with two panels, pop-out sunvisor and a peekaboo window. Surprisingly, the basket is very decent size and easy to access. A big plus for such a compact model. Aside from the compact fold, I think it’s best feature is amazing maneuverability! It’s very easy to navigate in tight spaces and push with one hand. The wheels glide over any flat surface and can even handle some terrain thanks to the “soft drive” system, which enables you to navigate over rougher terrain without having to lock the wheels in place. The fold is very intuitive and one-hand. There is also auto-lock, but no standing fold. At this point you are probably wondering if this model is so good, why it’s on the 4th place. This is mainly due to the outrages price of $499 from 6 months and $674 (what?!) for the from birth package which doesn’t include the infant car seat btw. I think for that price I can get three different stroller for each occasion. Here is my full review of Babyzen Yoyo+Plus. Pros: single handle bar, compact fold, light weight, deep recline, great maneuverability, large canopy, nice side barriers, large basket. When it comes to umbrella strollers Maclarens are the BEST! Yes, they cost an arm and a leg, but will last you for many years and many kids. The Maclaren products are so durable they even offer a LIFETIME warranty. How great is that? So, if this is your first child and you are planning on having more, invest in it! Sometimes I do think of a good stroller as an investment because you can use it for many years and then sell it. The Techno XT deserves the 1st place because it is an outstanding umbrella stroller that is made out of high quality materials. While weighing only 15 lbs, it has many features of a luxury full size stroller like deep one-hand recline, huge canopy, adjustable handle bars, adjustable leg rest, and all-wheel suspension. The canopy is huge especially for an umbrella model and, what other stroller has adjustable handle bars? One-hand 4-position recline is suitable from birth and up to 55 lbs. There is also a built-in newborn safety system which includes a foot mesh and a head barrier that will protect your child from sliding out of the seat. Although it does not take an infant car seat it works with a Maclaren carrycot that you can use from birth. The carrycot creates kind of an umbrella-pram. LOL. But, my favorite feature of Techno XT is the maneuverability. The double hard rubber wheels glide over surface. Very easy to push and navigate over terrain (for an umbrella model). Traveling will be easy with compact fold, and a carry handle. Pros: adjustable handle bars, deep seat, wider sides, light weight, adjustable leg rest, flat recline, newborn safety, huge canopy, carrycot option. The Quest model is a smaller brother of my favorite Techno XT. Very similar to Techno XT, but doesn’t have adjustable handle bars, and the wheels are a little smaller. Everything else is the same. These two small changes resulted in the weight drop of 2 lbs bring it down to only 13 lbs. Despite the light weight it can still accommodate a child up to 55 lbs thanks to durable aircraft grade aluminium frame. And, it still has adjustable leg rest, huge canopy, nice basket, all-wheel suspension, and compact fold. While the handle bars are not adjustable, they are pretty tall at 42″ from the ground. The seat has one-hand lever recline with 4 different positions including an almost flat one suitable for a newborn. Although it does not take an infant car seat, you can use it with Maclaren carrycot for a newborn. BTW, it also has that built-in newborn safety system. Pros: deep seat, wider sides, light weight, adjustable leg rest, flat recline, newborn safety, huge canopy, carrycot option. The UPPAbaby G-Luxe is almost as popular as Maclaren models. All of the UPPAbaby products are super durable and made out of high quality materials. The G-Luxe model weighs only 15 lbs, but can accommodate a child from 3 months and up to 55 lbs. The seat is very roomy and well padded. Amazing canopy! The SPF 50+ sunshade is large and has a pop-out sunvisor that offers great protection. The canopy is also height adjustable and goes up to 27″ so a taller toddler will have no problem fitting in. The one-hand recline is very deep, but doesn’t go to the flat position that’s why it’s recommended from 3 months. The adjustable leg rest together with a full recline provides a pretty comfortable napping space. The high performance wheels together with all-wheel suspension provide a smooth ride (for an umbrella stroller). The fold requires both hands, but it’s your regular umbrella fold. On the bright side there is a standing fold, auto lock, and a carry strap for easy traveling. There is NO travel system option. This buggy is not cheap retailing for around $279. I would like to see a $50 drop in price to make it more competitive with new models on the market. For 2018 it got completely redesigned. There are too many updates to list here, but one thing I really like is that the sides of the seat are much wider now so your child will have much better side support. Pros: adjustable leg rest, large canopy, deep recline, nice padding, larger wheels, standing fold, flip-flop-friendly brake, easy compact fold, tall handle bars. Cons: no peekaboo window, high price. Joovy has pleasantly surprised everybody with its new updated Groove Ultralight 2017/2018 model. Now, it has a lot of the same features as Maclaren and G-Luxe, but for much lower price. My favorite Groove feature is the flat recline suitable for a newborn. The seat is very roomy with plenty of padding. It can accommodate a child from birth and up to 55 lbs (till college. LOL). Just like Maclaren the seat has built-in newborn safety system which includes a foot mesh and a head barrier. I think they’ve copied it from Maclaren. Little babies will be able to stretch their little legs thanks to adjustable leg rest. The canopy is huge and sits high on the frame leaving a lot of head room for a taller toddler. There is also a nice peekaboo window with a Velcro closure in the canopy. Tall parents will be happy to see tall handle bars that leave plenty of leg room. It rolls on four double 6″ (which is a max size you would find on umbrella model) hard rubber wheels that together with all-wheel suspension provide a great maneuverability. It has your typical umbrella fold that requires both hands. The adjustable carry strap, automatic lock, and standing fold make it very easy to travel with. You can throw it over your shoulder since it weighs only 15 lbs. It comes in four colors and retails for only $189. Now, you are probably wondering why would anybody buy Maclaren Techno XT if Groove has all the same features and costs less? While they are very similar, Techno XT has adjustable handle bars, can take carrycot for a newborn, and has deeper sides (wider side “barriers”) which make it much more comfortable for smaller babies. There is also a little more padding on Techno XT seat. While the wheels are the same size, the Techno XT has an easier push. There has been NO UPDATES for 2018. Pros: light weight, large canopy, plenty of storage, flat recline, adjustable leg rest, all-wheel suspension, tall handle bars, good price, standing fold. The G-Lite is a smaller brother of G-Luxe. If you want a lighter stroller (only 11 lbs!) with less features for an older child the G-Lite could be the answer. The lower price also makes it more attractive for parents who are trying to downsize and already wasted all their money on the fancy travel system. LOL. Despite light weight, aluminum frame is very durable and can accommodate a child up to 55 lbs. The seat is roomy and deep with a nice padding at the bottom. For 2018 they’ve added a small zipper recline, but you still have to use it from 6 months. There is no adjustable leg rest nor the travel system option. The back of the seat is made out of breathable mesh which is great during hot summer days, but might be a little chilly in cold weather since there is no cover. The side barriers are not as wide, but because there is no padding on the back of the seat there is enough side support. The G-Lite still has that large SPF 50+ sunshade with pop-out sunvisor that is positioned high on the frame providing more head room for an older toddler. For 2018 the canopy has been redesigned a little and now has three panels instead of one, but still great coverage. The basket is not a bad size and actually easily accessible thanks to the small recline. Surprisingly, it can hold up to 10 lbs (what?! it’s almost the weight of the stroller). You will also enjoy the included cup holder, tall handle bars, and all-wheel suspension. Pros: light weight, large canopy, compact fold, durable frame, tall handlebars. Cons: small recline, no adjustable leg rest, small plastic wheels, no peekaboo window, no travel system option, no flip-flop-friendly brake. The Mountain Buggy Nano has been one of the first strollers with super compact fold that could fit in the overhead compartment on the airplane. That feature made it very popular among traveling parents. There is a lot of things I like about Nano like roomy seat, high large canopy, and adjustable leg rest. While it weighs only 13 lbs, it can still convert into a travel system which is unique for such a light weight. The seat has a deep strap recline, but doesn’t go to the flat position so you can use it from 6 months and up to 44 lbs. If you want to use it from birth you can turn it into a travel system or get a Mountaing Buggy soft-shelled carrycot that you put into the seat. The rear wheel suspension together with 5.5″ EVA wheels provide a smooth ride (on a flat surface). The handle bar is not adjustable and is located at 39″ (40″ is average). Because it’s a single handle bar, it’s much easier to navigate with one hand. Nano folds to a small size and has a standing fold. Now, let’s talk about things that can be improved. The buckle on harness is a puzzle piece that takes forever to put together. The basket is hard to access because of the cross bar. The fold is compact, but takes a lot of work. After folding it, you have to bend down to the ground to activate the auto lock and then it takes another step to secure the canopy. It comes in three colors and retails for around $249. Pros: adjustable leg rest, travel system option, standing fold, large canopy, good venerability, one hand push, rear suspension, deep recline. Cons: hard to access basket, puzzle buckle, pain-in-the-behind fold. The GB Pockit really shocked everybody with its tiny fold and was recorded by the Guinness World Records as ‘world’s smallest folding stroller’. Of course parents went crazy over it. I think it’s a great stroller for traveling because it fits everywhere: small backpack – no problem! Small carry on- no problem! Computer bag – no problem! In 2018 GB came out with an upgraded version of Pockit called ‘Pockit Plus+’ that has the same compact fold, but has also a recline and can turn into a TRAVEL SYSTEM. Wow! The canopy got much better, but still has ways to go in my opinion. The Plus+ model weighs only 13 lbs, but has a roomy seat that can accommodate a child from 6 months and up to 55 lbs. The seat has a small strap recline so you child can take a nap. The basket is medium size and easy to access since there is not recline. It has very small footprint so navigating in tight spaces is easy. Pros: smallest fold ever, light weight, high weight limit, roomy seat, ok basket, travel system option. Cons: small canopy, small wheels, from 6 months. Summer Infant 3D Lite is #1 best selling stroller on Amazon. With over 1,000 positive reviews from parents it have earned a 7th place on my list. So, why do parents love it so much? First of all, it costs only $79 which is a great deal for a real not-a-doll stroller. Second reason is the light weight of only 13 lbs which makes it easy to travel with. It also has a deep recline so your child can take a comfy nap. The seat is very roomy and if you look at the photo, you will see that it has nice wide side barriers that offer plenty of support. I like that! It can accommodate a child from 6 months and up to 50 lbs. There is no travel system option. The 6″ wheels do well on flat surface and can handle some cobblestone (for a short distance), but I wouldn’t go on rough terrain. The maneuverability is not as good as on expensive strollers, but it will get you from A to B. There is also ront-wheels suspension which is a big plus for such a budget friendly stroller. Most parents buy this stroller for traveling because they don’t want to risk damaging their expensive full size models. Despite the low price, 3D Lite is very sturdy stroller that can withstand some abuse. And honestly nobody will cry too much if it gets scratched or damaged after check in. Pros: budget friendly, light weight, one-hand fold, deep recline, plenty of storage, front-wheel suspension, good storage. Cons: small canopy, two-hand recline, fold is not very intuitive. After seeing the popularity of Babyzen Yoyo and Mountain Buggy Nano, Baby Jogger decided also to come up a super compact model called City Tour. This model has a very compact one-hand fold and meets carry-on requirements so you cant take it on board of any air plane. It weighs only 14 lbs, but is sturdy enough to accommodate a child up to 45 lbs. The seat is roomy with a deep recline that is suitable from 6 months. There is no travel system option so there is no way to use it from birth. The side barriers are not bad and offer support. 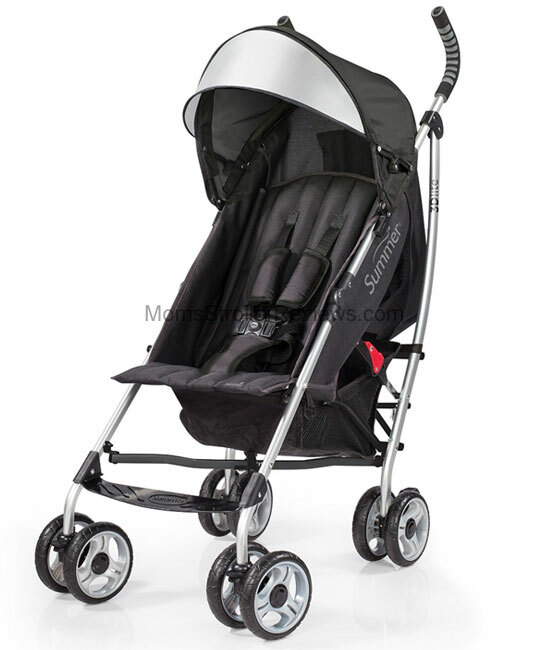 Baby Jogger is known for large canopies and City Tour has a very decent size UV 50+ three-panel canopy with a pop-out sunvisor and a peekaboo window. Tall single handle bar makes it easy to push with one hand. The maneuverability is very good on flat surface. The wheels are single, but decent size 5″ and 6″. It also features auto lock, and standing fold. I do like a reasonable price of $199. What I didn’t like is lack of storage. The basket is small and hard to access. There are no additional pockets and this stroller is a little tippy so if you want to hang a diaper bag on it make sure you get clips and add them to the sides where the stroller folds. Another thing that would be nice is a shoulder strap connected to the stroller. It does come with a backpack style storage bag, but who has the time putting it in when you are using public transit? Pros: one-hand compact fold, deep recline, large canopy, tall single handle bar, standing fold, good side barriers. Cons: no carry strap, hard to access basket, from 6 months only. Sorry for such a long post. I tried to make each description as short as possible while providing you with the most important info. If have a question or need help narrowing down your choices, let me know by using the comment box below and I will do my best to answer it as soon as I can. I am here for you! Would you pick the Mountain Buggy Nano over the GB Pockit Stroller? They are about the same price. The new Pockit can recline a little. Does it recline as much as the Nano? We do want to take it on the planes with us. We do care about the comfortness for the baby. We just can’t seem to choose between the two. The Baby Joggy City Tour seems to be angled in a weird way. Our baby seems to be only holding by the harness. Baby seems to be sliding down all the time. Is this also a problem? Thanks! Hi, I love your reviews. I have a 17 month old, and I have a Uppababy Cruz. I previously had a City mini and a Chicco Liteway. I am looking to either replace my Uppababy Cruz with 1 stroller that does it all, or to get a second stroller mainly for traveling and short trips. The main thing we need is a good stroller that is lighter than the Cruz, has a good canopy, is easy to fold, and allows for my daughter to sit in a more upright position (she hates being reclined, unless she is asleep). We loved the City Mini when she was a baby, the fold is just awesome and easy, and the wheels do well in most terrains, but even at its most upright position its too reclined for her. I also didn’t like that the basket was too small. The mini travel very well (both in planes, trains, and cities). The Chicco Liteway was annoying to fold and unfold, I dislike the fold of the typical umbrella stroller, and I also don’t particularly like that you need two hands to push it and very much prefer a one handle. So in other words, I am looking for a stroller that is lightweight, but has some nice features like a good size canopy, an easy fold, and some storage (this last one is not a must). I also don’t want to spend too much on one. My daughter likes the Cruz, the canopy is good size, and has ample storage, but I just don’t see myself traveling abroad with it. Is there a stroller out there that combines the awesome features of the City Mini with the Uppababy Cruz? I am open to either replacing my stroller, or getting a 2nd stroller just for travel and short trips mainly. Any advice here will be much much appreciated. I just want to say YOU ARE AMAZING! I have spent months, weeks, days, nights and hours just researching strollers! Its crazy how a stroller can be almost perfect but its missing that ONE thing that the cheapest competitor might have. Its most frustrating and almost no one understands my plight except YOU! You give all the info needed when reading a review and the best comparisons BAR NONE! THANK YOU! My husband and I are planning on a. Cruise with our 3 year old and 10 month old. We are thinking of bringing 1 stroller to minimize stuff to fly/in our cabin. Plan is to get a stroller they can share, when the toddler is in there I will carry the baby and when the baby is in there in toddler will walk. I need a reco on a stroller that is lightweight, good vetting for the Caribbean weather, good recline for napping and on the go diaper changes, can be a carry-on (gate checked) and really easy, fast and small to fold for the airport, cruise check in and cruise cabin. What stroller do you think would be best? Hi Susan, I live in Chicago in a third floor walk up. I need a light weight stroller that can handle cracked sidewalks and snow. It’s also important to have something compact to maneuver through small restaurants and shops. I’m not sure the light weight strollers can handle the city, but I’m nervous to carry anything heavy up three flights of stairs. Any recommendations based on my situation? Thanks in advance!